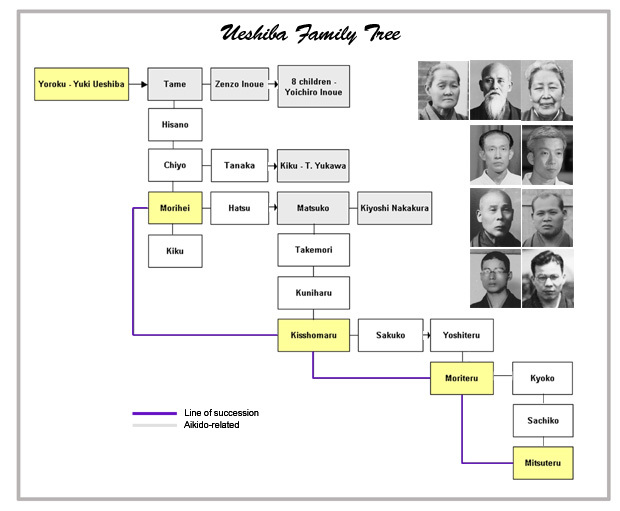 In this screencast, Stanley Pranin presents a chart containing an abbreviated genealogical tree of the Ueshiba Family and discusses Morihei Ueshiba’s family background, aikido-related relatives, and the line of succession in aikido. – Morihei’s parents and sisters, especially, the importance of the marriage of the oldest sister, Tame, to Zenzo Inoue, and their son, Yoichiro. – Kisshomaru’s selection as Morihei’s actual successor, and the Ueshiba family line of succession including the present Doshu, Moriteru Ueshiba, and his son and future Doshu, Mitsuteru Ueshiba. Ok, let’s get started. First of all, Morihei’s parents were his father, Yoroku, and mother, Yuki. Yoroku was a prominent resident of Tanabe, moderately wealthy, and a long-serving town council member. The couple had a total of 5 children, 4 daughters–Tame, Hisano, Chiyo and Kiku–and one son, Morihei. Morihei was the fourth born. Morihei’s eldest sister, Tame, married a man named Zenzo Inoue about 1889. Zenzo was one of Tanabe’s wealthiest citizens. Their union produced eight children, the fourth of whom was a son named Yoichiro. This Yoichiro was a rebellious boy and was raised for several years in Morihei’s household. Zenzo was very closely allied with Morihei’s father, Yoroku, and was highly influential in a number of key decisions made in Morihei’s life that ultimately allowed him the freedom and means to become a professional martial arts instructor, and later create aikido. Zenzo’s son, Yoichiro, would, as a young man, become one of Morihei’s most active collaborators, and assist him professionally and financially over a period of some 20 years. Aikido would surely not have been born had it not been for this fortuitious marriage and the vast fortune of the Inoue family. I have treated this subject in some depth in my article titled “Yoichiro Inoue: Aikido’s Forgotten Pioneer” for those interested in exploring this topic further. Morihei, in turn, married a woman from Tanabe by the name of Hatsu Itogawa in 1903. Their union produced four children: a daughter, Matsuko, two sons, Takemori and Kuniharu, both of whom died in infancy, and finally, Kisshomaru born in 1921, whose actual given name was Koetsu. Matsuko is important to aikido history due to her marriage in 1932 to a famous swordsman by the name of Kiyoshi Nakakura. Upon becoming Morihei’s adopted son, Nakakura took the name of “Morihiro Ueshiba” as Ueshiba’s successor. As events turned out, Nakakura left the Ueshiba family after five years in 1937. Morihei also arranged for the marriage of his niece, Kiku, to one of his top students, a man named Tsutomu Yukawa, around 1936. Yukawa operated a dojo in Osaka until his untimely death in 1942. Morihei’s youngest son, Kisshomaru, took over the Kobukan Dojo during the height of World War II in 1942 at the age of 21. From that time forward, Kisshomaru remained in charge of the Hombu Dojo and it was assumed he would succeed his father. In 1948, Kisshomaru married Sakuko Habutsu, the younger sister of Koichi Tohei’s wife, and once again Morihei acted to strengthen aikido’s supporting structure through marriage liaisons. Upon Morihei’s death in 1969, Kisshomaru did indeed succeed Morihei’s as aikido’s Second Doshu and acted in that capacity for the next 30 years until his passing in 1999. The present Doshu, Moriteru Ueshiba, in turn succeeded Kisshomaru. Moriteru has two children, and his son, Mitsuteru, is already being groomed as his successor. Mitsuteru will one day be aikido’s Fourth Doshu. Aikido is unusual among modern Japanese budo in that it has a so-called “iemoto,” or family succession system. The Ueshiba family line has formed the core around which the art has grown and flourished worldwide in the postwar era. 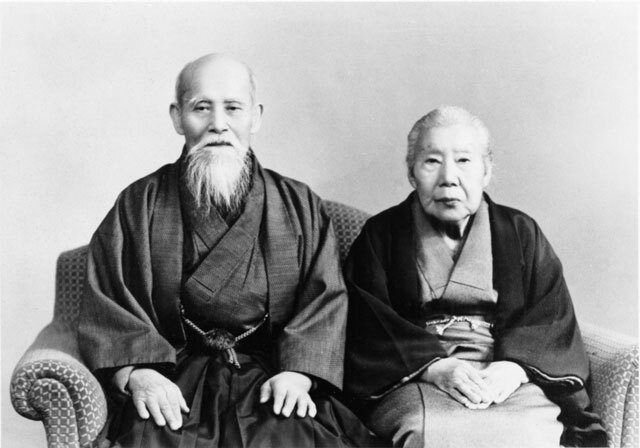 Well, that wraps up our quick look at the Ueshiba family tree. I hope you’ve enjoyed it. This is fascinating, Mr. Pranin. The depth of your research, the information you provide us with as well as your narration style put together with the (presently) unpublishable facts help us understand better the reasons behind the present state of aikido. Thanks a lot for all this information. I learnt many things.